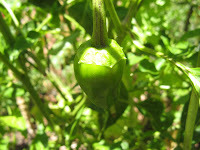 These wonderful little green peppers are now planted every year in my garden. I still can't figure out why I only plant 2 plants instead of a whole field of the things. They are not exactly sweet, and they are not spicy (though occasionally you'll get one with more of a bite to it.) but they have the most incredible flavor. I usually cut off the stem, slice them fairly thin lengthwise and then sauté them in olive oil with a little bit of salt. 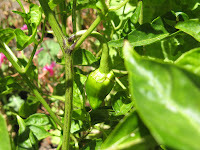 Sometimes to stretch out the flavor I sauté several with a bell pepper. I then spoon this mixture over slices of fresh bread and add some feta cheese on top. It is incredible. These peppers originally come from Spain and on my trip to Spain last month I learned that they are specifically from Galicia. And it looks like Galicia has fairly cool summers, so maybe that's why they grow well here. In Spain they serve padron peppers as tapas. They fry them up whole in olive oil and you pop them in your mouth. They also served them much bigger than I had been harvesting. The first year I bought them from the nursery, the tag said harvest at olive size. Though they are ready to eat then, in Spain, they harvest them at a much larger size. Maybe 2 inches long. So this year that's what I'm doing. So Saturday I took some friends visiting from Oregon to the German Tourist Club on Mt. Tam. I had never been, so I was very interested to check it out. I had been past it years before when it was closed, and was very curious. Two separate friends visited it earlier this summer and that sealed it. The German Tourist Club is the local branch of the Nature Friends, " a non-profit confederation of over 500,000 hikers, climbers, skiers and others who love the outdoors." It is in the middle of the forest on Mt. 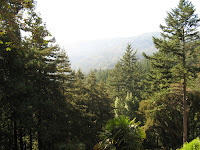 Tam and is a short hike from the parking area across from Mountain Home Inn or a longer hike from Mill Valley on the Dipsea. It is open most weekends to the public (see website for directions and schedules) when they serve German beer and snacks. 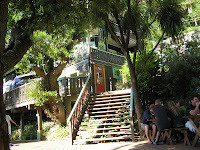 A great time was being had by all, with kids running around, people drinking, playing games, and soaking up the sun. I still can't believe I had never been before. I will definitely be going again. After drinking a little too much beer we decided to continue our hike on the east side of Mt. Tam with some stunning views of the bay. 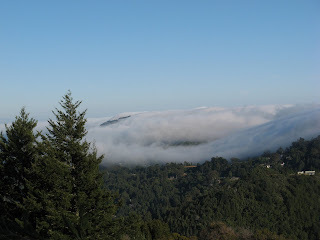 The fog (this being summer) was just starting to pour in through the golden gate and then over the Marin headlands. As the sun got lower in the sky, the light lit up the trees (in the pic are some madrones) and the fog moved in thicker and faster. A very San Francisco kind of summer day. We planted this Ribes malvaceum in our front yard where we had cut down a diseased, misplaced camelia. 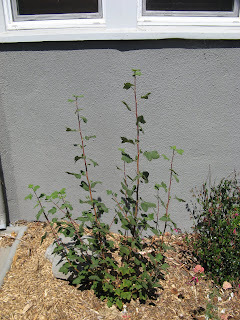 I wanted a Ribes sanguineum glutinosum, the one native to this area, but this is what I had. And since this is a rental, this is what the front yard got. Ribes are hardy, fast-growing plants. I grew this ribes from a cutting I took a little over a year ago. I planted it from a one gallon in March at about 10 in tall. And it's now almost up to my chest. These things grow fast. And have beautiful hanging flower sprays in the spring. 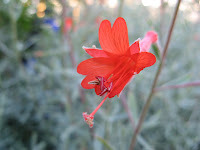 Pete from East Bay Wilds has a good pic of the blooms on flickr. 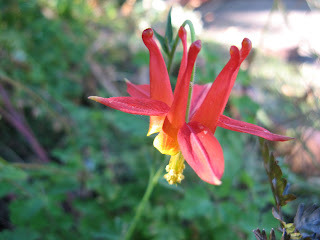 My columbine were done with their latest bloom (the fourth full bloom in about a year and a half), but then it sent up a small stem with a few flowers a couple of days ago. Luckily for me. 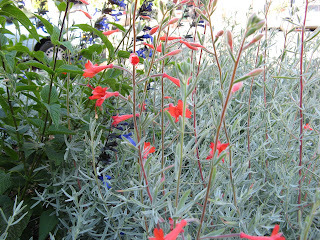 The California fuschia (Zauschneria californica) just started to bloom a few days ago. I think ours is later than normal for local gardens, but we just planted it in March or April and it's not on irrigation. 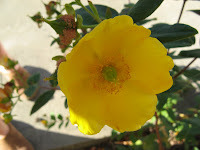 A close up and then St. John's Wort, a beautiful flower. Linanthus grandiflora aka mountain phlox. 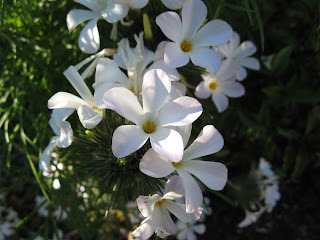 Though california phlox seems a better name since it's not really a mountain flower. 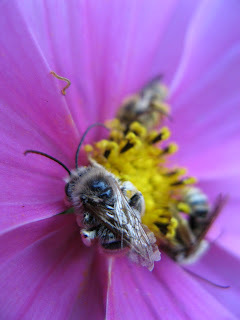 And just above the Linanthus is a cosmos that has been holding sleeping bees regularly. We joked they were on a nectar high and couldn't make it back to the hive. You can also see a tiny worm in the pic. And thanks again to Carol at May Dreams Gardens for hosting Bloom Day. The Lost Ladybug Project is a website that is trying to collect data on the range of different ladybugs here in North America. The website has a lot of stuff geared to children and is still being built up, but is interesting nonetheless. 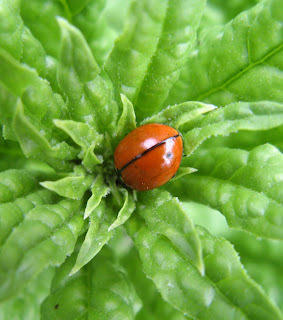 They ask visitors to collect and photograph ladybugs, giving info on where, when and how they were found. Here is one I found in my garden in about 30 seconds of looking. They mention on their homepage that exotic species are increasing in North America to the detriment of our native ones. Remember this next time you want to buy and release ladybugs in your garden as pest management. Planting host plants and waiting for them to find your garden seems a better idea. Yerbabuena. This amazing little plant is probably one of my favorites. It's native along the coast from British Columbia to Baja California. 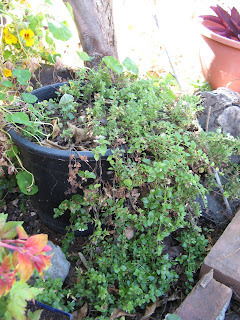 It looks great in shady areas of the garden and will trail out of pots or over things, rerooting as it goes. It has tiny white flowers and a great scent. Though not a true mint it can be used in much the same way. I make a tea out of it. Supposedly, it can also be used medicinally, good for the stomach like mint. And Bay Natives and Bee Vision Blog have some other uses. It comes from the Spanish hierba buena, meaning good herb, a general term used throughout the Spanish-speaking world for local mint varieties. It was evidently very common here in the Bay Area as the original name for the town of San Francisco was Yerbabuena. Later the town's name was changed in honor of the mission. Now it's the name of the island that splits the Bay Bridge in two and a center for the arts in San Francisco. I've known it as Satureja douglasii, but I'm also finding it under Clinopodium douglasii. Anyone know which it is? So two weeks ago I took a class on California Native Medicinal plants at Heather Farm in Walnut Creek taught by Tellur Fenner. An interesting class, just some bare bone basics, but we did learn how to use a few things. 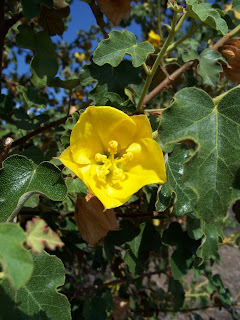 One of the most surprising for me was making a cold infusion out of Fremontodendron californicum, also known as flannelbush. Cold infusions are made by soaking something suspended in cheese cloth or muslin overnight, usually 1oz of an herb in 32oz of water. Fremontodendron forms a mucous-like substance when soaked in cold water, which is good for coating the throat or esophagus, in other words for sore throats. 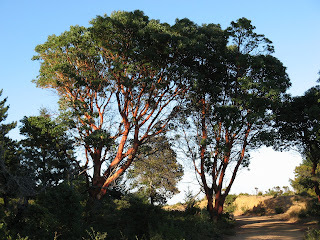 We used the flowers, leaves and outer bark all dried and crushed or cut very small. You can use all three parts in combination or any of them individually. He said it was used similarly to slippery elm for those in other parts of the country. I have to say as a gardener I don't really like this plant. Don't get me wrong, the plant is really beautiful, but I'm pretty sensitive to the little hairs on the leaves which make my skin itch and burn. It's very popular here in the Bay Area and people always seem to want me to prune one, or take it out or otherwise put myself in the middle of it. Fair enough, I suppose since they're paying me. And now that I know it can be used practically for sore throats I can appreciate again. If you are sensitive Tellur Fenner recommended straining it well, or I figure I can just use the flowers and bark.